After weeks of unrelenting price increases, the average cost of a gallon of unleaded gasoline declined about three cents during the past week, according to the latest survey from the U.S. Energy Information Administration. However, the drop in gas price will not be noticeable for most American drivers. The reason is that the national average was lead by a major regional price drop in the Midwest, where the cost of fuel dipped by as much as 13¢ in Ohio, and by an average of about 7¢ across most other states in the American heartland. 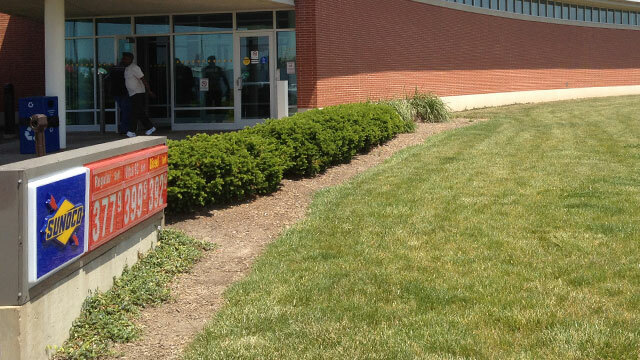 An Ohio Turnpike Service Plaza in May 2012. Average gas prices in the Buckeye State were just about this level last week. 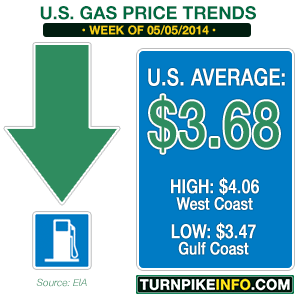 This week, the price plunged to $3.63 per gallon, leading the Midwest Region in a significant drop in gas prices. California contributed to a price drop in the Western regional states, but the decline in prices was confined primarily to Southern California, according to the EIA report. In San Francisco, gas prices remained largely unchanged. For the broader West Coast region, sans the Golden State, the price of gas actually ticked upward. The news is almost anticlimactic for most drivers. Drivers in all but one of the survey regions are paying considerably more for gasoline going into the summer of 2014 than they were last year. In fact, Midwesterners are the only drivers paying less, but that is the result of this week’s price declines, and the region is given volatile price swings. The average U.S. gas price is about 15¢ per gallon more this year than last, and in some regions, the price is 25¢ more than it was at this time in 2013. The price of crude oil and blended gas futures has helped fuel recent price hikes for consumers, and while recent stockpiles of both crude and some refined fuels have increased in recent weeks, the actual refined motor fuel supply has been going down. That has kept consumer gas prices up, even when prices of crude oil or reformulated blend stocks have gone down. But crude oil prices typically have wild price swings as investors bid futures contracts up or down, depending upon rumor and news. While West Texas Intermediate crude, WTI, is down from its recent highs, it is still hovering just under $100 per barrel on the New York Mercantile Exchange, NYMEX. Moreover, the WTI futures for June are still at price levels that have not been seen since the summer of 2011. WTI’s counterpart, Brent Light Sweet Crude, also remains at high levels. 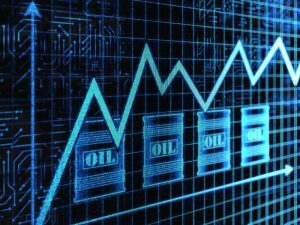 The futures contract for foreign oil remained near $108 per barrel Monday evening, even though it has come down from recent highs that placed the contract over $110/bbl. Part of the reason is the continued geopolitical instability in Ukraine. The political tinderbox that is Eastern Europe flared over the weekend, with military confrontations in both east and west Ukraine. The bloody clashes have impelled European leaders to begin to take seriously the need to diversify their energy sources, which could include some of the surplus U.S. oil and, crucially, natural gas reserves. A two-day conference of the Group of Seven ministers got underway Sunday in Rome, with the U.K. Energy Secretary, Ed Davey, telling reporters the G-7 was looking to diversify its energy supplies in the coming months and years. However, many analysts believe any resources the United States could contribute, to help wean Europe from Russian energy, would take years to deliver at consistent levels. Anas F. Alhajji, chief economist at NGP Energy Capital Management LLC in Irving, Texas, told Bloomberg natural gas supplies from the U.S. likely would not start flowing until at least next year, and possibly 2016. Still, Davey and the G-7 seemed determined there would be nothing short of a major overhaul in relations with Russia’s energy sector. “We’re determined after this crisis not to go back to business as usual,” Davey said. How that will impact U.S. gas prices, both in the short term and the long run, remains to be seen. Natural gas is not used for fueling most U.S. cars, although many business and government fleets make use of natural gas for their cars. If supplies of natural gas tighten, due to new shipments to Europe, there is the potential for a longer-term impact on prices for other motor fuels.